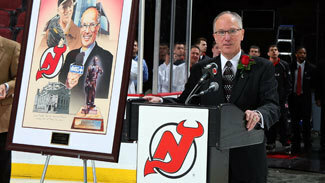 NEWARK, N.J. -- The New Jersey Devils will pay tribute to one of the most recognizable, astute and gifted hockey broadcasters of this generation on Friday when Mike "Doc" Emrick returns to Prudential Center for a little red-carpet treatment. The ceremony, slated to begin at 7 p.m. ET, will be followed by the Devils facing off against the Vancouver Canucks at 7:25 p.m.. Many believe Mike Emrick earned the nickname "Doc" after receiving his doctorate in radio and television from Bowling Green State University in 1976. While that may be true, someone had to be credited with labeling one of the most influential sports broadcasters of our time. "I started course work in 1971 for two years, and at the end, felt like I needed to earn a living so I did the second period of Bowling Green ice hockey home games for two years," Emrick told NHL.com. "That's 18 periods for two different years, but I sent tapes out and got my first chance in the pros in Port Huron, Mich., with the Port Huron Flags and continued to work on my dissertation while I was in the (International Hockey League). I finished up in '76." In 1977, Emrick was hired by the Maine Mariners of the American Hockey League, broadcasting the club's Calder Cup titles in 1978 and '79. "The president of the [Mariners], Ed Anderson, started calling me 'Doc' because I had the degree," Emrick said. "Everyone in Port Huron knew me as Mike because I certainly wasn't a doctorate guy then. But Ed, who later went on to own the AHL's Providence Bruins and still lives up in Maine, was actually the first guy to call me that." Emrick did television play-by-play for the Devils for 21 seasons on the MSG Network before announcing this past July he would leave that post in order to cut down on his travel time. He now works exclusively for NBC and NBC Sports Network. Friday's ceremony provides the Devils organization and its fans an opportunity to pay tribute to a man who had become a staple of professional hockey in the Garden State for more than two decades. "I feel it's been a privilege and an honor to have him be a part of our organization for the number of years that he was here," Devils President and General Manager Lou Lamoriello said. "The amount of preparation and professionalism that he brought in to us, day in and day out, with no exceptions; you just can't say enough about it. I don’t know if there's anyone that I've ever heard say a negative word about him. I think that type of credibility in the people he's serving in the position he's in, it just says everything about him." During his nearly 40 years as a play-by-play announcer, Emrick has been behind the microphone for many of the most memorable games in modern hockey history, including 13 Stanley Cup Finals and 23 Game 7 playoff matches. He's been the lead play-by-play announcer for the NHL on Versus, NBC Sports Network and NBC since 2005. "The great thing about Doc was his willingness to start at the very bottom and through hard work and crafting his skills, become the best of his generation," Glenn "Chico" Resch, Emrick's partner for 15 years in New Jersey, told NHL.com. On Dec. 12, he became the first media member inducted into the U.S. Hockey Hall of Fame when he was enshrined alongside former players Chris Chelios, Gary Suter and Keith Tkachuk and Philadelphia Flyers builder Ed Snider. Emrick has called NHL games for most of North America's major networks, while also serving as the voice of the Flyers from 1988-93 and Devils from 1993-2011. He received the Lester Patrick Award in 2004 and Hockey Hall of Fame's Foster Hewitt Memorial Award for outstanding contributions to hockey broadcasting in 2008. He was the first hockey broadcaster to earn a national Emmy Award for 'Outstanding Sports Personality - Play by Play' in 2011 -- beating out the likes of Joe Buck, Jim Nance, Bob Costas, Al Michaels and Verne Lundquist. Emrick, who took voice lessons early in his career, told NHL.com in December that there were three veteran broadcasters who had a major influence on his career. "Bob Chase is still doing games for the Fort Wayne Komets -- he did play-by-play for that game I attended in 1960," Emrick said, referring to a game during his youth that turned him onto the sport. "Bob has talked to more people on radio than any other broadcaster in the U.S. The Komets are 60 years old and this is his 59th season behind the mic. Only Vin Scully [Brooklyn/Los Angeles Dodgers] has been with the same team longer than Bob Chase. Bob used English very well, and I think that was part of why I enjoyed him." Emrick also credited Canadian radio and television broadcaster Danny Gallivan and longtime Flyers' broadcaster Gene Hart for shaping his career. "I loved the way Danny could use words that would stick with you and be a part of the fun you had in watching a hockey game," he said. "I got to travel with Gene a lot during my time with the Flyers and he thought about the science of calling a game." Resch will always consider Emrick a walking encyclopedia of hockey knowledge. "Doc always had the heaviest black bag with statistics," Resch said. "That thing should have been on rollers but he threw it over his shoulder. Doc was my 'Google'. He always wrote down specific plays and events and would then talk to people on the inside to get the story -- he then remembered those stories. "His brain was like a little file. His memory was great and that's what separated him from everyone else. He'd always go to managers and ask them about incidents, diving into the second layer of a story that most color or play-by-play guys wouldn't do. Those were the stories he loved to tell to his audience."